I'm like the US Postal Service in that weather doesn't stop me from my nightly watch. There doesn't even have to be stars. In fact, I've been known to accumulate an inch of snow on my blankets, at times. Only a hard rain can keep me away, because at that point, sitting under my soffit will no longer keep me dry. When I'm out there looking up at the stars, you'd think I'd be contemplating the enormity and wonder of the universe. And sometimes I do. I wonder how far away a particular star is or think about how it could have died a thousand years ago, but I can still see it because it's more than a thousand light years away. It's like peering into history. Over time, I've become marginally capable of spotting constellations and such. 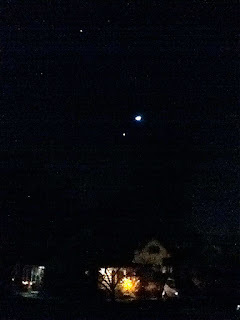 I can always spot Mars, because it really does have a redder cast than other "stars" (yes, I know Mars is a planet). And I like to look for Orion, not only because I can spot it easily, but also because its belt is made up of three stars called the Three Sisters. And I'm one of three sisters. Then, of course, there's the Big Dipper or Ursa Major. And I check for Polaris most nights, just to make sure it's still there. If it should happen to disappear suddenly, I want to know first hand. The Mayan Calendar. The long count Mayan calendar dates back to the 5th century BC. It is more accurate than our Gregorian calendar because it measures the length of a year essentially down to the second. We add a leap day every 4 years to account for this difference, measuring a year as 365.25 days. In fact, a year is 11 minutes shorter than that which, over decades and scores and centuries, adds up. The Mayans, in 500BC knew about those 11 minutes based on precise calculations made on data observed over hundreds of years. They devoted generations of observation to the sun and night sky to create the most accurate calendar known to man—over 2500 years ago! The Antikytheria Mechanism. Recovered from a shipwreck in 1900 and dated back to the 1st century BC, this mechanism is known as the world's first computer. Among other things, it precisely measures the location of celestial bodies and also accounts for that extra quarter day each year—150 years before any official calendar ever did. With all our modern instruments, we still don't know how they made it or why. The Pyramids, Stonehenge, etc. Whether Mayan or Egyptian, the pyramids display multiple alignments that correspond to the night sky—not just within the individual pyramids themselves, but between multiple pyramids miles apart. Stonehenge was built in 3000-2000 BC and contains astrological elements, including stones that mark solstices and equinoxes. Around the world there are lesser structures that shadow light in a certain way, depending upon where the sun is, also pointing out solstices and other celestial events. It's not just the years of observation that went into the certainty behind creating these structures, but the import placed on the sun, moon and stars that drove ancient man to find ways to create megolithic structures. We still don't know how they created those structures without modern machinery. But they found a way. It was that important to them. In addition to all that, some believe that many prehistoric cave paintings were actually drawings of constellations, rather than animals...they were using animals to represent what they saw in the night sky. We're talking 15,000 or more years ago...before farming and "civilization" itself. Certainly those who were so attuned to their environment couldn't miss certain patterns in the night sky. But if they were actually recording them? It boggles the mind! This is stuff that we're still figuring out today and ancient man, if not prehistoric man, had a bead on it way before they had instruments to measure and observe it. We walk through our days, focused on getting to a destination or completing an errand and we never stop to just take in our environment. As a result, our pets and children (and ourselves) seem to age all of a sudden. We mean to get around to something and years later it's still left untouched. We fail to see relationships slipping away. Let's face it, our focus on intentional observation has diminished considerably over time, unless you're a scientist or something. And with it, we've lost that sense of mystery and awe that kept ancient man on the edge of his seat when it came to things like the night sky. Now it's just something many of us take for granted. Which begs the question...what else might be going on right under your nose that you might not be noticing? Watch grass grow. With spring upon us, now would be a great time to observe what's popping out of the ground and how fast it grows. Check one or two times a day and compare to surrounding plants. Who grows faster? Who dies faster? What can you learn from that? See the world from your front stoop. I've lived in my home for 13 years and only sat on the front stoop for the first time recently. Things look different from the front stoop. Someone in a house in my eyesight opened an upstairs window and dropped a sack of trash out of it right into a bin sitting 15 feet below. This was apparently a regular thing they did. And I never knew. I never saw certain neighbors come home from work or who jogs down the street. Never knew what the squirrels out front did at dusk or what it smelled like when neighbors cooked dinner. It's a whole different world I had never appreciated before. Go sky watching. Jupiter and Saturn will be big and bright in the sky throughout March 2013. And March 12th seems to be the best time to spot the comet PANSTARRS in the western sky within an hour after sunset. This isn't about intuition or psychic power. It's not about hugging trees or talking to squirrels. This is about using our good, old powers of observation to see something that's been happening right in front of us all our lives, only we've just never taken the time to notice. Prehistoric man's life depended upon it. And you'd be surprised at just how important an oversight it may be in your life once you start looking. Our ability to observe and be conscious of our surroundings is directly proportional to the amount of control we claim over our existence. You can go through life with blinders on, living in a world of chaos where things just happen to you. Or you can bring order and personal responsibility into your world by paying attention to the bits and bytes of information streaming toward you at any given time. In short, you can see stuff coming long before it smacks you in the head. The more conscious we become of our environment, the more informed we are. It's that simple. Whether you believe in God, angels, fate, science, the Universe or nothing at all, messages and clues are streaming in toward you all the time. Some of them are wrapped in beauty and wonder, while others are wrapped in red flags. But if you have your head down plowing through your day, you're going to miss them. And you'll have nobody to blame but yourself.